Gleason is chairman of Gleason Corp., a Rochester-based manufacturer of machinery and equipment for the production, finishing and testing of gears used in automobiles, airplanes, trucks, tractors, wind turbines, power tools and industrial equipment founded by his great-grandfather in 1865. He is also chairman of the Gleason Family Foundation, an independent grantmaker that supports schools and universities, as well as cultural and human service organizations. Three generations of the family served on the RIT board, and James Gleason is a trustee emeritus. In 1998, he and the foundation gave $12 million toward RIT’s College of Engineering, which was renamed in honor of Kate Gleason, Mr. Gleason’s great aunt. 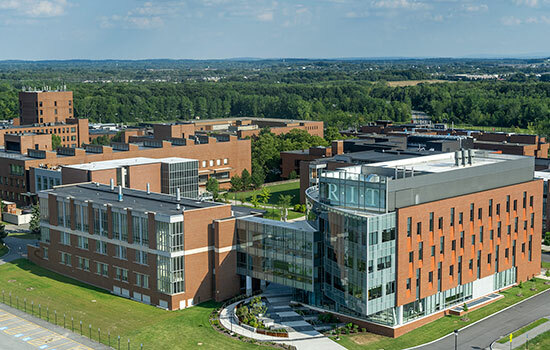 In 2003, the foundation donated $6 million toward an undergraduate and graduate facilities expansion project in the college, and in 2010 gave $3 million to create the Gleason Family Foundation Faculty Development Fund to recruit and retain faculty for RIT’s new chemical and biomedical engineering programs. In 2016, the foundation donated $3 million to create the Harvey J. Palmer Endowed Professorship to honor the college’s retiring dean. On campus, Kate Gleason Hall, James E. Gleason Hall and Eleanor Gleason Circle are named for Gleason family members. Golisano is the founder of Paychex Inc., a Rochester-based provider of payroll, human resource and benefits outsourcing solutions for small- to medium-sized businesses nationwide. In 1985, he founded the B. Thomas Golisano Foundation, one of the largest private foundations in the United States devoted exclusively to supporting people with intellectual and developmental disabilities. An emeritus member of the RIT Board of Trustees, Golisano donated $14 million in 2001 toward the creation of the B. Thomas Golisano College of Computing and Information Sciences. In 2007, he committed $10 million to establish the Golisano Institute for Sustainability at RIT, and in 2011 committed $2 million toward the construction of the Gene Polisseni Center. In 2015, it was announced that RIT is the site for Golisano’s personal and professional archives, a collection housed in The Wallace Center and displayed in Golisano Hall that celebrates his entrepreneurial and philanthropic impact through photos, video, newspaper clippings, memorabilia and other records. Kodak’s history of supporting and partnering with RIT dates back to 1887, when company founder George Eastman made his first donation—a $50 gift—to the university’s forerunner, Mechanics Institute. He later donated $5,000 to the institute in 1892 and served as a trustee from 1890 through 1915 (including for three years as chairman). In 1901, Mr. Eastman donated $625,000 (approximately $17 million today) to Mechanics Institute, and the institute’s Eastman Building in downtown Rochester was opened that same year. Kodak also played an instrumental role in the establishment of RIT’s photography programs. Kodak also contributed $1 million to the Golisano Institute for Sustainability in 2010. George Eastman Hall at RIT is named for Kodak’s founder, and the nearby Eastman Kodak Quad celebrates the 100-year history of partnership between the two institutions. Established as the Japan Shipbuilding Industry Foundation in 1962 to focus on philanthropy related to the shipping and maritime fields, the Nippon Foundation today supports programming in education, social welfare, public health and other fields. In 1993 and 1994, the foundation donated $2 million to establish the Ryoichi Sasakawa Scholarship at RIT’s National Technical Institute for the Deaf. The scholarship (now known as the Sasakawa-DeCaro Scholarship) provides financial assistance for deaf and hard-of-hearing students from developing countries to attend RIT. Those students are then expected to return to their home countries to contribute to the betterment of deaf and hard-of-hearing people there. Beginning in 2001, the Nippon Foundation funded the Postsecondary Education Network-International (PEN-International) program at NTID. PEN-International was an NTID-based, multinational partnership of colleges and universities created to improve and expand postsecondary educational opportunities for deaf and hard-of-hearing students around the world by sharing educational technology and conducting faculty development and training, particularly in developing countries. Partner institutions from Japan, China, the Czech Republic, Thailand, the Philippines and Russia participated. The foundation donated more than $11.46 million toward PEN-International over 10 years. Following the completion of PEN-International, the Nippon Foundation supported the Pre-College Education Network (P-CEN) at NTID, with a mission of creating a cooperative network of educational institutions providing secondary education for deaf and hard-of-hearing students in Southeast Asia to ensure that they would not be blocked from postsecondary educational and employment opportunities. The foundation donated more than $3.7 million toward P-CEN over five years. Saunders, a prolific entrepreneur, is currently president and CEO of Saunders Management Co., having previously launched several companies, including Truckstops of America chain (now TravelCenters of America), which grew into the largest full-service truck stop and travel center network in the United States; Griffith Energy, a liquid fuel distribution company; Sugar Creek Corp., a chain of retail gas and convenience stores; and Genesee Regional Bank. An emeritus member of the RIT Board of Trustees, Saunders donated $13 million in 2006 to support RIT’s academic business programs, and the College of Business was renamed the Saunders College of Business in his honor. In 2010, he pledged an additional $5 million to expand facilities, enhance technologies, create three endowed professorships and establish six graduate fellowships per year at the college. The gift launched a challenge directed at alumni and friends to raise an additional $15 million, a challenge that was successfully completed in 2017.